A few site-specific endonucleases are currently known which recognize and cleave methylated DNA only. These enzymes do not require cofactors besides Mg2+ ions and, therefore, can be considered to be IIM site-specific endonucleases . These are restriction endonuclease DpnI, which recognizes and cleaves the nucleotide sequence 5'-G(6mA)↓TC-3'  and site-specific endonucleases BisI and GlaI described in our works. The latter ones recognize and cleave DNA sequences 5'-G(5mC)↓NGC-3'  and 5'-G(5mC)↓G(5mC)-3' , , respectively. The present paper describes a new enzyme BlsI, which belong to IIM type of site-specific endonucleases and is a neoschizomer of recently discovered enzyme BisI . BlsI recognizes the nucleotide sequence 5’-G(5mC)N↓GC-3’ and cleaves it as shown by an arrow with the formation of 3’-protruding ends. The bacterial strain Bacillus simplex 23 was isolated from soil according to screening procedure described earlier . Morphological and physiological-biochemical properties of the strain were studied as described in . The strain was identified according to the classifier  as well as by analyzing the nucleotide sequence of 16S ribosomal RNA . The strain was grown in a fermenter at the temperature of 30°C in 20 L of nutrient medium containing 1% Trypton (Organotechnie, France), 0.5% yeast extract (Organotechnie, France), 0.5% NaCl and 0.05% MgCl2, at pH 7.5 with aeration at 10 L/min and stirring at 200 rev/min. When the culture reached the late logarithmic growth stage, the cells were harvested by centrifugation. As a result, 100 g of biomass was obtained and frozen at -20°C. All procedures of enzyme isolation were performed at the temperature 4°C. Forty grams of frozen cells were suspended in 100 ml of Buffer A (10 mM Tris-HCl, pH 7.5, 0.1 mM EDTA, 7 mM β-mercaptoethanol) containing 0.2 M KCl, 0.3 mg/ml of lysozyme and 0.1 mM phenyl methyl sulphonyl fluoride (PMSF). The cells were disrupted by ultrasonic disintegrator Soniprep 150 (MSE, England) 10 times 1 min each at 1 min intervals to cool the suspension. The crude lysate was clarified by centrifugation for 30 min at 12,000g on a J-2-21 centrifuge (Beckman, USA). Enzyme was isolated by chromatographic purification of the supernatant on the following resins: 30 ml of phosphocellulose P-11 (Whatman, England), 5 ml hydroxyapatite (Bio-Rad, USA), 7 ml of heparin-sepharose (Bio-Rad, USA). First the supernatant was applied to a P-11 phosphocellulose column pre-equilibrated with Buffer A containing 0.2 M KCl. The column was washed with 60 ml of Buffer A containing 0.2 M KCl, then with a linear gradient of the KCl concentration (0.2 M - 1.5 M) in Buffer A. Fractions with endonuclease activity were combined and applied to a hydroxyapatite column pre-equilibrated with Buffer B (10 mM KH2PO4, pH 7.5, 0.1 mM EDTA, 7 mM β-mercaptoethanol, 0.2 M KCl). The column was washed with 10 ml of Buffer B, then the protein was eluted by a linear gradient of the KH2PO4 concentration (0.01 M - 0.5 M) in Buffer B. Active fractions were combined, dialyzed against 20 volumes of Buffer A and applied to a heparin-sepharose column equilibrated with Buffer A containing 0.2 M KCl. The column was washed with 14 ml of Buffer A containing 0.2 M KCl. The enzyme was eluted by a linear gradient of the KCl concentration (0.2 M – 1 M) in Buffer A. Active fractions were combined and dialyzed against a concentrating buffer (50% glycerol, 10 mM Tris-HCl, pH 7.5, 0.1 mM EDTA, 7 mM β-mercaptoethanol, 0.2 M KCl). The enzyme preparation was stored at -20°C. 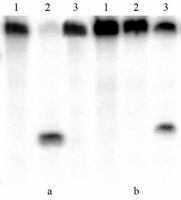 The plasmid pFsp4HI1 was used as a substrate to determine the activity of BlsI . This plasmid contains Fsp4HI DNA-methyltransferase gene from Flavobacterium sp. 4H, which modifies the first cytosine base in the nucleotide sequence 5'-GCNGC-3'. Thus, plasmid pFsp4HI1 contains methylated sites 5’-G(5mC)NGC-3'/3’-CGN(5mC)G-5’. BlsI displays the maximum of activity in a buffer of the following composition: 10 mM Tris-HCl, pH 8.5, 5 mM MgCl2, 100 mM NaCl, and 1 mM β-mercaptoethanol supplemented with BSA (bovine serum albumin) to the final concentration of 0.1 mg/ml. This buffer was used in all experiments on DNA cleavage by BlsI. The activity of the site-specific endonuclease BlsI in the course of purification was determined by incubating aliquots of fractions with pFsp4HI1 plasmid DNA. 2 μl- aliquots of the corresponding fractions from the chromatographic purification were added to 40 μl of the reaction mixture containing 2 μg of pFsp4HI1 plasmid DNA in the reaction buffer. The reaction mixture was incubated for 30 min at 30°C. The reaction products were separated in 1% agarose gel. The patterns of specific cleavage of different DNAs were used to determine the specificity of enzyme BlsI. Different plasmid and phage DNAs as well as synthetic oligonucleotide DNA duplexes containing or non-containing methylated bases were used as substrates in determining the enzyme specificity. 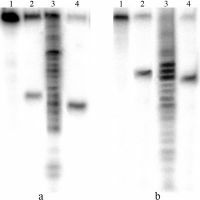 The recognition site of the site-specific endonuclease BlsI was determined by comparison of pFsp4HI1 plasmid DNA hydrolysis by enzymes BisI and BlsI. DNA cleavage was performed under optimal conditions (30°C, reaction buffer – 10 mM TrisHCl, pH 8.5, 5 mM MgCl2, 100 mM NaCl, 1 mM β-mercaptoethanol, 0.1 mg/ml BSA) for 1 hour. The cleavage products of plasmid DNA were separated by gel-electrophoresis in 1.5% agarose. The recognition site was confirmed in experiments on cleavage of synthetic oligonucleotide duplexes. The positions of DNA hydrolysis by the site-specific endonuclease BlsI were determined by comparison of the fragments lengths after cleavage of a [32P]-labeled synthetic oligonucleotide duplex with endonucleases BlsI and BisI. The products of partial cleavage of the same duplex by endonuclease III from E.coli (ExoIII) were used as a fragment length marker. Hydrolysis products were separated by electrophoresis in 20% PAAG with 7 M urea in tris-borate buffer. The bacterial strain producing enzyme BlsI has the following characteristics. It forms white, smooth, bright, non-transparent, convex, round colonies 4 mm in diameter on Luria-Betrani medium agar. The cells are rod-like of 1x(3-5) μm, single or arranged in pairs or short chains. They form elliptic centrally located spores, which do not inflate sporangia. Cells are gram-positive, catalase-positive and oxidase-negative and do not grow under anaerobic conditions. They grow at the temperature of 10-40°C. Based on morphological and biochemical properties as well as the nucleotide sequence of 16S ribosomal RNA, the strain was identified as Bacillus simplex 23. Site-specific endonuclease produced by it was called BlsI. The enzyme was isolated from the cellular extract by consecutive chromatographic procedures as described in “Experimental conditions”. The enzyme yield was 200 u./g of raw biomass, and the concentration was 1,000 u./ml. Endonuclease BlsI does not hydrolyze standard viral and plasmid DNAs used to detect and to determine the activity of restriction endonucleases such as the DNAs of phages λ and T7, adenovirus-2, plasmids pUC19 and pBR322. Plasmids containing the genes of some bacterial methylases modifying cytosine bases in the DNA were also tested in DNA cleavage experiments: M.Fsp4HI methylates DNA with the formation of the sequence 5’-G(5mC)NGC-3’) , M.HspAI modifies DNA with the formation of the sequence 5’-G(5mC)GC-3’ , M.FauIA and M.FauIB methylate DNA with the formation of the sequences 5’-C(5mC)CGC-3’ and 5’-G(5mC)GGG-3’, respectively . The results have shown that enzyme BlsI specifically cleaves only pFsp4HI1 plasmid DNA which carries 5'-G(5mC)NGC-3'/3’CGN(5mC)G-5’ DNA sequences. Figure 1 presents the results of pUC19 and pFsp4HI1 plasmids DNA hydrolysis by the site-specific endonucleases BlsI and BisI. BlsI and BisI don’t cleave pUC19 and cut pFsp4HI1 plasmid DNA in the same way. The obtained data show that site-specific endonucleases BisI and BlsI cleaves only methylated DNA and BisI and BlsI have a similar recognition sequence. Fig. 1. The comparison of the DNA fragment lengths after pFsp4HI1 (A) and pUC19 (B) DNA cleavage by endonucleases BlsI (run 1) and BisI (run 2). Electrophoresis in 1/5% agarose gel. K - pFsp4HI1 plasmid DNA, M – 1 Kb molecular weight DNA marker (SybEnzyme) with the following DNA fragment lengths (kb): 10; 8; 6; 5; 4; 3; 2.5; 2; 1.5; 1; 0.75; 0.5; 0.25. As it is seen from Fig.2, endonuclease BlsI cleaves duplex NN1*/NN2 containing the methylated sequence 5’-GCNGC-3’, but does not cleave duplex NN01*/NN02 containing the same non-methylated sequence. Thus, BlsI really cleaves only methylated nucleotide sequences 5'-G(5mC)NGC-3'. Fig. 2. The cleavage of oligonucleotide duplexes NN01*/NN02 (a) and NN1*/NN2 (b) by endonucleases Fsp4HI (run 2) and BlsI (run 3). Run 1 – control DNA duplex without hydrolysis. Labeled oligonucleotides are shown with the sign *. The work on investigation of BlsI ability to cleave the recognition site with different distributions of methylated cytosine bases will be described separately. Thus, the present work characterizes the site-specific endonuclease BlsI, which is a neoschizomer of enzyme BisI. Enzyme BlsI belongs to a rare group of site-specific endonucleases, which recognize and cleave only methylated DNA. Endonucleases BisI and BlsI recognize the nucleotide sequence 5'-G(5mC)NGC-3'/3’CGN(5mC)G-5’, but BlsI, unlike BisI, cleaves it with the formation of 3’-protruding ends. So, BlsI is the first site-specific methyl-dependent endonuclease that cleaves DNA with the formation of 3’-protruding ends. As both enzymes BisI and BlsI were found in bacterial strains referring to Bacillus genus, one can suppose that these enzyme might play some special role in Bacillus cells. Our previous suggestion that these enzymes provide the protection of bacteria against infection with phages containing methylated DNA is the most probable one . It is known that a number of bacteriophages reproducing on Bacillus genus cells contain the genes of site-specific DNA-methytransferases, which results in the methylation of the phages’ DNAs in a number of nucleotide sequences, including the site 5’-GCNGC-3’ . In this case, the role of enzymes BisI and BlsI may consist in the cleavage of methylated DNA of bacteriophages penetrating the cell and, therefore, in the protection of the Bacillus cell against infection with the virus. We believe that BisI and BlsI may be used for detection and analysis of methylated sites in eucaryote DNA, which usually contain a considerable number of 5-methyl cytosine bases and participate in the regulation of cellular processes . Roberts, R.J., Belfort, M., Bestor, T., Bhagwat, A.S., Bickle T.A., et al. A nomenclature for restriction enzymes, DNA methyltransferases, homing endonucleases and their genes // Nucleic Acids Res. – 2003. – V. 31. – P. 1805-1812. Lacks, S., and Greenberg, B.J. // Biol. Chem. - 1975. - V. 250. - P. 4060-4066. Chmuzh E.V., Kashirina J.G., Tomilova J.E., Mezentseva N.V., Dedkov V.S., Gonchar D.A., Abdurashitov M.A., Degtyarev S.Kh. New endonuclease restriction Bis I from Bacillus subtilis T30 recognizes methylated sequence DNA 5’-G(5mC)^NGC-3’ // Biotechnology. - 2005. - 3. - P.22-26 (in Russian). [english online version]. Manual on practical studies in microbiology / Edited by N.S. Egorov. - Moscow, 1995. Bergey's manual of systematic bacteriology / Edited by Holt J. et. al. : the 9th Edition in 2 Volumes: Translated from English and edited by RAS Acad. G.A. Zavarzin. - Moscow, 1997. Madden, T.L., Tatusov, R.L., Zhang, J. // Meth. Enzymol. – 1996. – V. 266. – P. 131-141. Chmuzh E.V., Kashirina J.G., Tomilova J.E., Chernukhin V.A., Okhapkina S.S., Gonchar D.A., Dedkov V.S., Abdurashitov M.A., Degtyarev S.Kh. Gene cloning, comparative analysis of protein structure of Fsp4HI restriction-modification system and biochemical characteristic of recombinant DNA- methyltransferase M.Fsp4HI // Molecular Biology. – 2007. – V. 41. –No. 1. – P. 1-9. Chernukhin V.A., Kashirina J.G., Sukhanova K.S., Abdurashitov M.A., Gonchar D.A., Degtyarev S.Kh. DNA-methyltransferase FauIA modifying the second cytosine residue in the non-palindrome sequence 5'-CCCGC-3' (isolation and properties) // Biochemistry – 2005. - V. 70. – No. 6. - P.829-837. Costello, J.F., and Plass, C. // J. Med. Genet. - 2001. - V. 38. - P. 285-303.